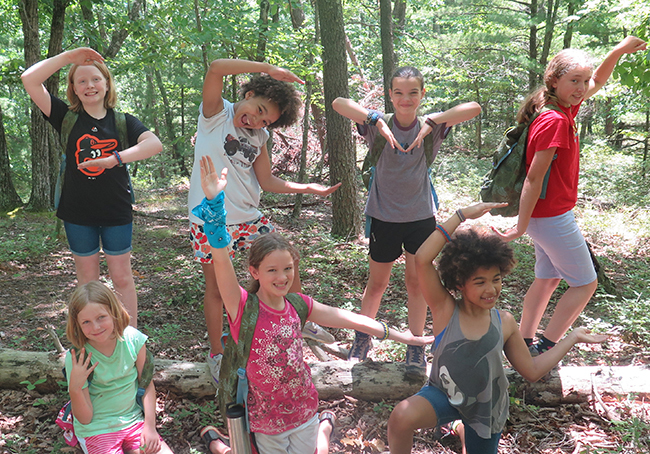 GEMS camp explores the connections between learning survival skills and learning to lead. If Allie Mitchem ever finds herself among the cast of TV’s Survivor, she’s certain to be in high demand as an alliance partner—even at the tender age of 13. After attending a five-day, overnight camp for middle-school-aged girls called Girls Empowered at Mountain Shepherd (GEMS) each of the last two summers, Mitchem is now skilled at making fires, building shelters out of a rope and a tarp, and finding food when stranded in the wilderness with no supplies. Allie Mitchem, 13, attended the camp in summer 2017. Until she attended GEMS camp, held on a secluded 100 acres in Catawba, Virginia, at the Mountain Shepherd Survival School, the most exotic thing Mitchem had ever eaten was calamari. As a camper, she gobbled down black ants, which she didn’t squish dead before ingesting. “You just have to grab it and eat it really fast,” she says. 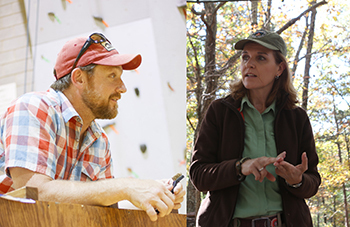 The partnership between Hollins and Mountain Shepherd Survival School, which is located about 40 minutes from campus, began in August 2012 when Bennett called Abrina Schnurman-Crook, executive director of the Batten Leadership Institute, to tell her about Mountain Shepherd Survival School. Schnurman-Crook connected Bennett with Jon Guy Owens, director of the Hollins Outdoor Program. The two clicked right away. “She’s one of my best friends now,” Owens says of Bennett, who trained sales staffs before becoming vice president of Mountain Shepherd Survival School, which was founded by her husband, Reggie. Jon Guy Owens, director of the Hollins Outdoor Program, team taught a Short Term class with Dina Bennett on survival skills. The course inspired the GEMS camp for middle-school-aged girls. 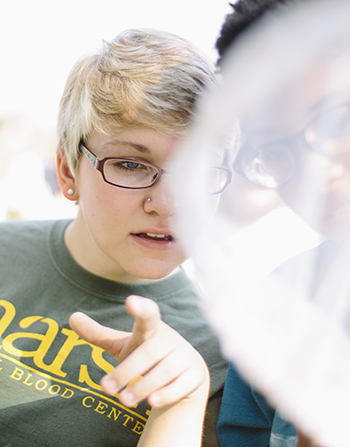 Kayla Deur ’16 took the course her junior year at Hollins, right before leaving to study abroad in Cambodia and Vietnam. Already active in HOP, Deur planned on a career in the outdoor industry after graduation. Early on, Deur admitted to her classmates she had never before traveled outside the United States, and she had big-time nerves about the upcoming semester. “Dina really supported that, and she took the time to help me find connections in the course that would help me prepare to study abroad,” Deur says. Deur and Bennett kept in touch during Deur’s time abroad and afterward. “When I got the idea to do the GEMS camp [for middle-school-aged girls], she was the first person I called,” Bennett says. Camp founder Dina Bennett (right) with a GEMS camper. By being on hand 24 hours a day, the three women got to know the campers very well. “We were all able to build really strong relationships with the girls,” Deur says. In addition to the three counselors, GEMS campers often receive visits from guest instructors such as Schnurman-Crook, Owens, and his wife, Anna Copplestone ’06 (psychology), ’15 (environmental studies), who works on campus as the coordinator of the IT help desk. The experience also affirmed Deur’s belief that girls in this age group need time in the wild. “I really like to see them learn how to stay true to themselves and not feel the pressure to change and adapt and fit in so much,” she says. Last summer, Mountain Shepherd Survival School offered four five-day overnight sessions of GEMS camp for 35 new campers, plus a week of GEMS camp 2, for 10 returning camp veterans to focus on backpacking and caving skills. 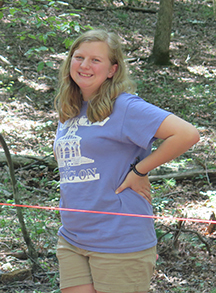 After that first summer of camp, Deur signed on as assistant manager of education programs at the Chesapeake Bay Foundation’s Brock Environmental Center, so she wasn’t able to attend GEMS camps in summer 2017. But she has already coordinated her schedule for the coming summer to be able to attend some of the GEMS offerings. “In typical Hollins fashion, I just want to do everything,” Deur says. The summer 2018 sessions will include a GEMS camp 3, which will emphasize canoeing and rock climbing for GEMS veterans, as well as a session for high-school girls. “I want to be able to still bring them in and catch them up,” Bennett says of the older students. Beth JoJack is a Roanoke writer and frequent contributor to Hollins magazine.